Does this sight look familiar? 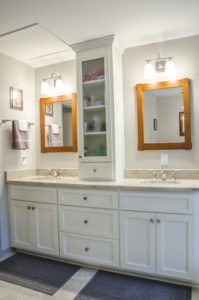 We can all imagine our bathrooms filled with products and other miscellaneous items that seem to make our countertops disappear. If this is the case, it may be time to consider alternative storage storage solutions for your bathroom renovation. Don’t forget about the wall space! This is especially true for small bathroom renovations that don’t have as much square footage available. Adding in a couple of shelves can be perfect for that extra bit of space that you need, while adding some visual interest to bare walls. 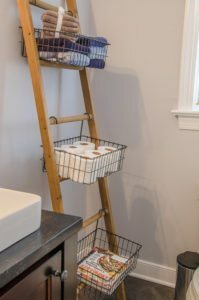 A small piece of furniture, such as a small dresser, bench, storage ladder, or any other idea you can think of can be the perfect storage solution for your bathroom. As a bonus, freestanding storage can be easily swapped out as your style changes-without requiring any wall touch-ups. Perhaps the most luxurious storage solution, custom cabinetry can be one of the best investments for your bathroom renovation, When designing your bathroom renovation, it is important to bring in a professional, such as Balducci Additions and Remodeling, to assess your current bathroom and assist you in determining the best cabinet solution for you. For example, a center vanity console divides two sink areas to create “privacy” while including an abundance additional storage space. Don’t neglect the space you already have! 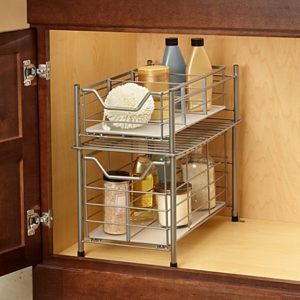 Is your under-sink cabinet being utilized to its fullest potential? If not, consider investing in sliding drawers or stacking bins. 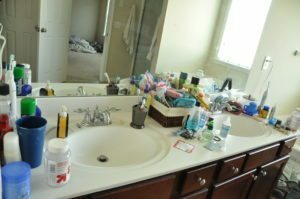 In comparison, if your under-sink area is open, purchasing baskets and bins to store away bath products are a necessity. 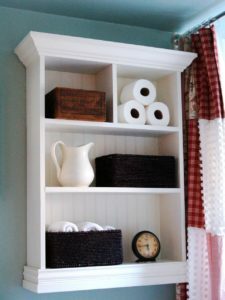 Storage is a huge concern for any homeowner-especially bathroom storage. These storage solutions are great ways to minimize the look of clutter and allow for relaxation. Your bathroom should be a place where you can escape the daily stresses of life-instead of feeling overwhelmed by clutter.